We make gloves and apparel for some of the biggest names in the industry, we just wish we could tell you who they are. Do you already have an OEM, Private Label or Custom Made glove or apparel program in place but aren't happy with the service or quality you're receiving? Let's talk and figure out, collectively, how we can get those problems resolved. Been turned away from other OEM, Private Label or Custom Made manufactures because they won't take on your project due to low quantities? When using any of our existing patterns, the Minimum Order Quantity for gloves is only 720 pairs of mixed sizes. Primax has been manufacturing high quality gloves and apparel for over 30 years and specializes in private label programs with a base of satisfied returning clientele. Customization of pattern, material, and colors offer thousands of different possible combinations. Use our existing design: The quickest and most economical way to personalize with your logo. Color and material change comes with minimal to no cost, given the design and pattern remains the same. Develop new glove: Starting from the ground up and designing a completely customized glove is an option but sample making, field trials, and approvals are all factors playing into adjusting details to get it just right. Please note that further changes in material or design may take extra time and capital. 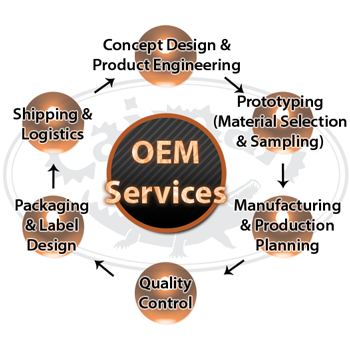 Why do I need am OEM / Private Label / Custom Made Glove or Apparel Program? Understanding which application or tasks the glove or apparel is intended for is vital in order to create a glove best suited to your needs. Our existing glove pattern requires a small MOQ of 720 pairs of mixed sizes. A new development requires 1200 pairs, plus die charges for each size. A $300 flat fee is applicable for initial sample with your logo. This charge covers administration and air freight cost, and will be credited towards your initial order. This is highly dependent on our production schedule, type of product and material availability. For an initial order under normal circumstances, please allow up to 120 days although we may deliver much sooner. All private label orders require a non-refundable deposit* equal to or greater than 50% of the total order amount, along with a firm purchase order. Primax will confirm delivery date by signing and returning purchase order to customer. Primax will inform customer 20-30 days before shipment arrival. Customer must pay the balance to take possession of the shipment. Customer must take delivery within 10 days from arrival date. If customer fails to take the delivery within 10 days from arrival date, Primax reserves the right to dispose of the shipment without any further liability including trademark infringement. Also, the 50% deposit will not be returned. *In the event Primax cannot deliver due natural disaster, accident, or other unforeseen circumstances, the deposit amount will be promptly refunded with no further obligation from the customer. Upon signing the PO, the customer agrees to all above terms and conditions.